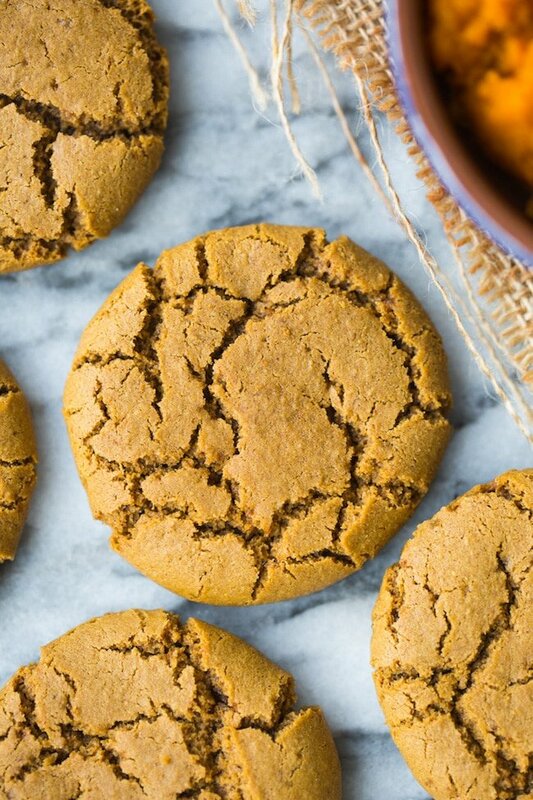 This Sunday is the first official day of Fall which means that it’s time for all things pumpkin, spice and everything nice….starting with these ultra soft and chewy molasses paleo pumpkin cookies. Altogether these cookies can be made in one bowl in under 40 minute. The hands on prep time is much less but that’s including about 10 minutes of fridge time about about 10 minutes of bake time. Easy! 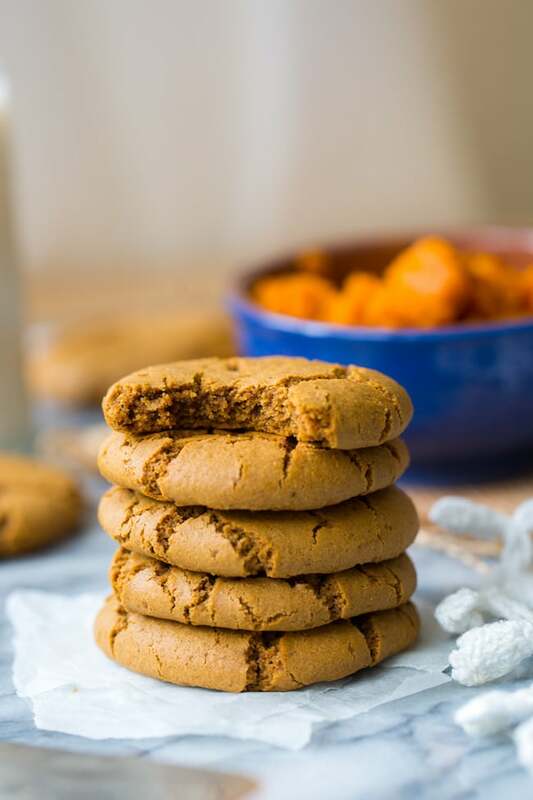 These paleo pumpkin cookies are pretty easy to make – it’s mostly just a matter of mixing together the wet ingredients and then mixing in the dry. Nothing too difficult or complicated here. Just mix and go. As I just mentioned I do recommend popping these cookies in the fridge for about 10 minutes – nothing too long. You just want to oil to solidify just slightly so it doesn’t spread too much while baking. While you’re heating up the oven and tidying up kitchen you can just let the cookies rest for moment in the fridge and that should be plenty of time. When you’re ready to bake take the dough out of the oven, roll the cookie dough into little balls, place on the baking sheet and flatten down with the palm of your hand slightly. I missed this step in the video but I do recommend doing this. It’s mostly just a superficial step but the cookies look a little too puffy otherwise. After about 10 minutes in the oven take the cookies out to cool for a few minutes and then you’re all set! Just one of the many reasons to love Autumn! 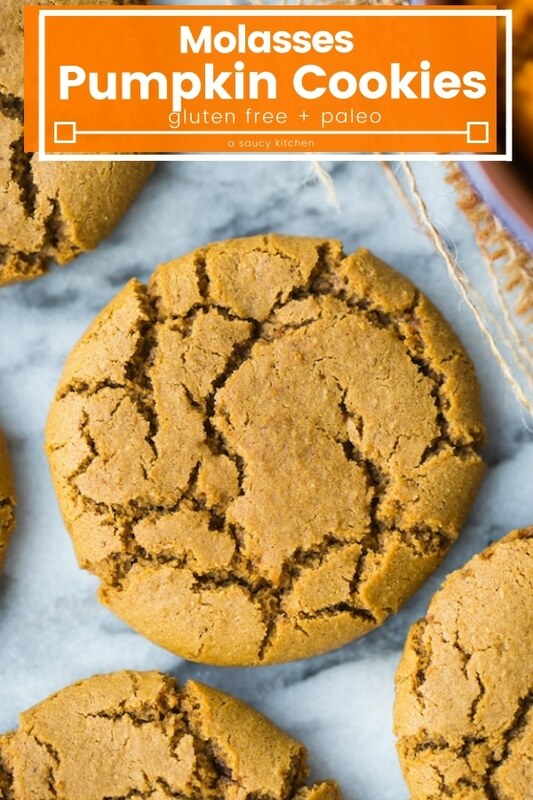 Don’t forget to #asaucykitchen on instagram if you these Paleo Pumpkin Cookies! I love seeing what you make! You can also post your pictures to my facebook page! In a mixing bowl, with an electric mixer beat together your melted coconut oil and coconut sugar. 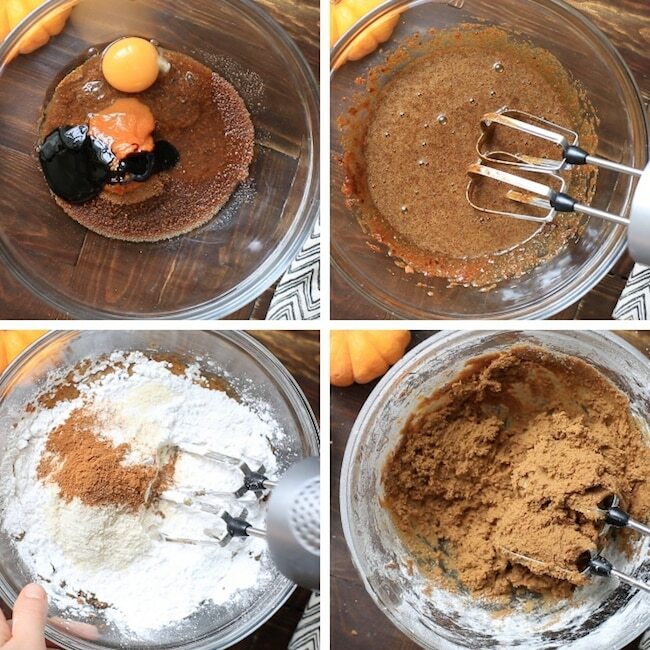 Add the egg, pumpkin, molasses, and vanilla extract until well combined. Once combined add your tapioca flour, coconut flour, baking soda, salt, cinnamon, and nutmeg to the egg mixture. On a medium speed, beat until everything is fully mixed together. Cover the dough and place in the refrigerator for at least 10 minutes. This time in the fridge helps the cookies set to prevent them from spreading too much while baking. Heat your oven to 325°F/170°C and line your baking sheets with parchment paper. Scoop out 1 tablespoon of the chilled dough and roll into a ball. Place the cookie dough balls on your lined baking sheet and leave at least 2 inches on all sides so that the cookies have room for spreading. Press the dough down slightly so that you get less of a rounded top on the cookie and then bake for 8-10 minutes until the slightly brown. Allow the cookies to rest on the baking sheet for a couple of minutes before moving to a cooling rack then enjoy! 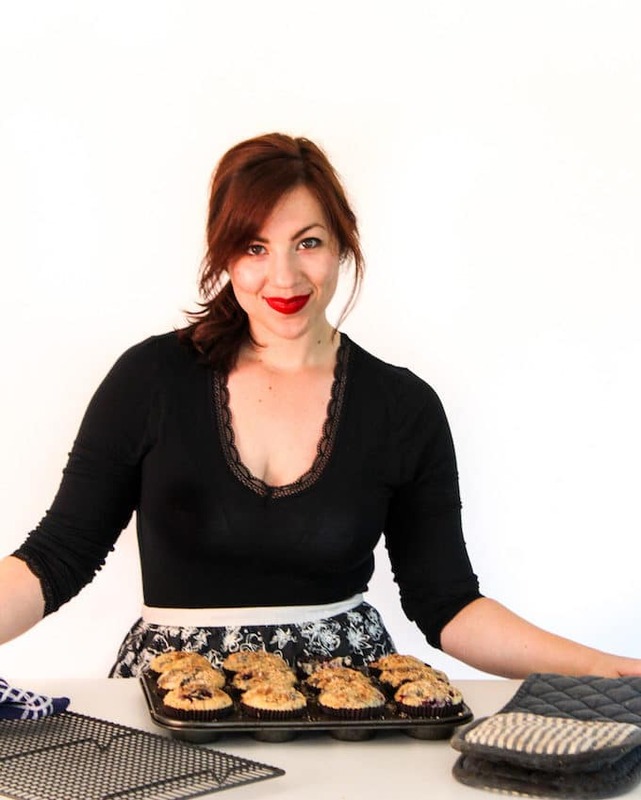 Hi Sarah, the flavor in these is very good, but the first time I made them they came out flat, not like yours with all the cracks in the surface. They also are dry and fall apart when you pick them up. I tried them again and chilled the dough much longer, but they are still flat. Is the temp. Right at 325? That seems low and 10 minutes is not long enough as far as I am experiencing. Mine tasted more like cake than a cookie. I wonder where I went wrong? Hi Kim! Pumpkin cookies typically come out more soft and cake like because of the pumpkin keeps things very soft. These were delicious! I used GF oat flour instead of tapioca because I had it on hand, also increased the pumpkin by 1 TBS. They are more chewy than cakey if stored in the fridge which I preferred, definitely making these again! Ooh thanks for sharing that Carthy – that’s super helpful to know! So glad you liked them! I just made them and used 1/4 cup applesauce in place of the egg and they came out great! Thanks for sharing the recipe! That’s so helpful to know! Thanks so much for sharing that Milly – glad you liked them! Thanks Bailey for letting me know Bailey – I’m gonna look into these again! I was so excited..then really disappointed 😔..I followed the recipe..was even happy cause they looked like the picture..but they are too dry..taste more tapioca than pumpkin..Not worth making again. Sorry to hear that Kim! pouvez-vous me dire par quoi peut-ont remplacer la farine de tapioca. These cookies look so delicious! Perfect for holiday season!